This article is about the former kingdom in Southern Africa. For other and related uses, see Zululand. 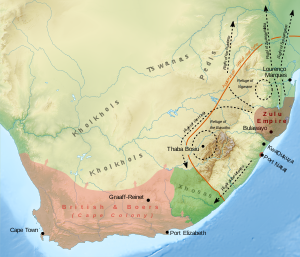 The Kingdom of Zulu (/zuːluː/), sometimes referred to as the Zulu Empire or the Kingdom of Zululand, was a monarchy in Southern Africa that extended along the coast of the Indian Ocean from the Tugela River in the south to Pongola River in the north. The kingdom grew to dominate much of what is today KwaZulu-Natal and Southern Africa. In 1879, the British Empire invaded, beginning the Anglo-Zulu War. After an initial Zulu victory at the Battle of Isandlwana in January, the British Army would regroup and eventually defeat the Zulus in July in the Battle of Ulundi. The area was subsequently absorbed into the Colony of Natal and later became part of the Union of South Africa. Shaka Zulu was the illegitimate son of Senzangakona, King of the Zulus. He was born c. 1787. He and his mother, Nandi, were exiled by Senzangakona, and found refuge with the Mthethwa. Shaka fought as a warrior under Jobe, and then under Jobe's successor, Dingiswayo, leader of the Mthethwa Paramountcy. When Senzangakona died, Dingiswayo helped Shaka become chief of the Zulu Kingdom. After Dingiswayo's death at the hands of Zwide, king of the Ndwandwe, around 1818, Shaka assumed leadership of the entire Mthethwa alliance. Shaka initiated many military, social, cultural and political reforms, forming a well-organized and centralised Zulu state. The most important reforms involved the transformation of the army, through the innovative tactics and weapons he conceived, and a showdown with the spiritual leadership, witchdoctors, effectively ensuring the subservience of the "Zulu church" to the state. Another important reform integrated defeated clans into the Zulu, on a basis of full equality, with promotions in the army and civil service becoming a matter of merit rather than due to circumstances of birth. The alliance under his leadership survived Zwide's first assault at the Battle of Gqokli Hill (1818). Within two years, Shaka had defeated Zwide at the Battle of Mhlatuze River (1820) and broken up the Ndwandwe alliance, some of whom in turn began a murderous campaign against other Nguni tribes and clans, setting in motion what became known as Defecane or Mfecane, a mass-migration of tribes fleeing the remnants of the Ndwandwe fleeing the Zulu. The death toll has never been satisfactorily determined, but the whole region became nearly depopulated. Normal estimates for the death toll during this period range from 1 million to 2 million people. These numbers are however controversial. By 1825, Shaka had conquered an empire covering an area of around 11,500 square miles (30,000 km2). An offshoot of the Zulu, the amaNdebele, better known to history as the Matabele created an even larger empire under their king Mzilikazi, including large parts of the highveld and modern-day Zimbabwe. Map illustrating the rise of the Zulu Empire under Shaka (1816–1828) in present-day South Africa. The rise of the Zulu Empire forced other chiefdoms and clans to flee across a wide area of southern Africa. Clans fleeing the Zulu war zone included the Soshangane, Zwangendaba, Ndebele, Hlubi, Ngwane, and the Mfengu. A number of clans were caught between the Zulu Empire and advancing Voortrekkers and British Empire such as the Xhosa . Shaka was succeeded by Dingane, his half-brother, who conspired with Mhlangana, another half-brother, and Mbopa, an InDuna, to murder him in 1828. Following this assassination, Dingane murdered Mhlangana, and took over the throne. One of his first royal acts was to execute all of his royal kin. In the years that followed, he also executed many past supporters of Shaka in order to secure his position. One exception to these purges was Mpande, another half-brother, who was considered too weak to be a threat at the time. Before encountering the British, the Zulus were first confronted with the Boers. In an attempt to form their own state as a protection against the British, the Boers began moving across the Orange River northwards. While travelling they first collided with the Ndebele kingdom, and then with Dingane's Zulu kingdom. In October 1837, the Voortrekker leader Piet Retief visited Dingane at his royal kraal to negotiate a land deal for the voortrekkers. In November, about 1,000 Voortrekker wagons began descending the Drakensberg mountains from the Orange Free State into what is now KwaZulu-Natal. Dingane asked that Retief and his party retrieve some cattle stolen from him by a local chief as part of the treaty for land for the Boers. This Retief and his men did, returning on 3 February 1838. The next day, a treaty was signed, wherein Dingane ceded all the land south of the Tugela River to the Mzimvubu River to the Voortrekkers. Celebrations followed. On 6 February, at the end of the celebrations, Retief's party were invited to a dance, and asked to leave their weapons behind. At the peak of the dance, Dingane leapt to his feet and yelled "Bambani abathakathi!" (isiZulu for "Seize the wizards"). Retief and his men were overpowered, taken to the nearby hill kwaMatiwane, and executed. Some believe that they were killed for withholding some of the cattle they recovered, but it is likely that the deal was a plot to overpower the Voortrekkers. 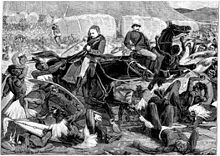 Dingane's army then attacked and massacred a group of 250 Voortrekker men, women and children camped nearby. The site of this massacre is today called Weenen, (Afrikaans for "to weep"). The remaining Voortrekkers elected a new leader, Andries Pretorius, and he led an attack. The Zulu forces and Dingane suffered a crushing defeat at the Battle of Blood River on 16 December 1838, when 15 000 Zulu impis (warriors) attacked a group of 470 Voortrekker settlers led by Pretorius. Following his defeat, Dingane burned his royal household and fled north. Mpande, the half-brother who had been spared from Dingane's purges, defected with 17,000 followers, and, together with Pretorius and the Voortrekkers, went to war with Dingane. Dingane was assassinated near the modern Swaziland border. Mpande then took over rulership of the Zulu nation. Following the campaign against Dingane, in 1839 the Voortrekkers, under Pretorius, formed the Boer republic of Natalia, south of the Tugela, and west of the British settlement of Port Natal (now Durban). Mpande and Pretorius maintained peaceful relations. However, in 1842, war broke out between the British and the Boers, resulting in the British annexation of Natalia. Mpande shifted his allegiance to the British, and remained on good terms with them. In 1843, Mpande ordered a purge of perceived dissidents within his kingdom. This resulted in numerous deaths, and the fleeing of thousands of refugees into neighbouring areas (including the British-controlled Natal). Many of these refugees fled with cattle. Mpande began raiding the surrounding areas, culminating in the invasion of Swaziland in 1852. However, the British pressured him into withdrawing, which he did shortly. At this time, a battle for the succession broke out between two of Mpande's sons, Cetshwayo and Mbuyazi. This culminated in 1856 with the Battle of Ndondakusuka, which left Mbuyazi dead. Cetshwayo then set about usurping his father's authority. When Mpande died of old age in 1872, Cetshwayo took over as ruler. On 11 December 1878, with the intent of instigating a war with the Zulu, Sir Henry Bartle Frere, on his own initiative and without the approval of the British government, presented an ultimatum to the Zulu king Cetshwayo in terms with which he could not possibly comply. British forces crossed the Tugela river at the end of December 1878. Initially, the British suffered a heavy defeat at the Battle of Isandlwana on 22 January 1879 where the Zulu army killed more than 1,000 British soldiers in a single day. The Zulus then suffered a heavy defeat at the Battle of Rorke's Drift on 23 January where the British army killed 350 Zulu warriors. The Zulu deployment at Isandhlwana showed the well-organized tactical system that had made the Zulu kingdom successful for many decades. This constituted the worst defeat the British army had ever suffered at the hands of a native African fighting force. The defeat prompted a redirection of the war effort, and the British, though outnumbered, began winning victories, culminating in the Siege of Ulundi, the Zulus' capital city, and the subsequent defeat of the Zulu Kingdom. 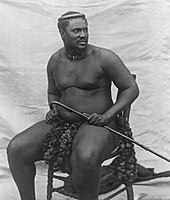 Cetshwayo was captured a month after his defeat, and then exiled to Cape Town. The British passed rule of the Zulu kingdom onto 13 "kinglets", each with his own subkingdom. Conflict soon erupted between these subkingdoms, and in 1882, Cetshwayo was allowed to visit England. He had audiences with Queen Victoria and other famous personages before being allowed to return to Zululand to be reinstated as king. In 1883, Cetshwayo was put in place as king over a buffer reserve territory, much reduced from his original kingdom. Later that year, however, Cetshwayo was attacked at Ulundi by Zibhebhu, one of the 13 kinglets. Cetshwayo was wounded and fled. Cetshwayo died in February 1884, possibly poisoned. His son, Dinuzulu, then 15, inherited the throne. The academic Roberto Breschi notes that Zululand had a flag from 1884 to 1897 but this is pure conjecture as A.P. Burgers notes in his book. It consisted of three horizontal bands in equal width of gold, green and red. Dinuzulu made a pact with the Boers of his own, promising them land in return for their aid. The Boers were led by Louis Botha. Dinuzulu and the Boers defeated Zibhebhu in 1884. They were granted about half of Zululand individually as farms, and formed the independent Republic of Vryheid. This alarmed the British who wanted to prevent the Boers access to a harbour. The British then annexed Zululand in 1887. Dinuzulu became involved in later conflicts with rivals. In 1906 Dinuzulu was accused of being behind the Bambatha Rebellion. He was arrested and put on trial by the British for "high treason and public violence". In 1909, he was sentenced to ten years' imprisonment on St Helena island. When the Union of South Africa was formed, Louis Botha became its first prime minister, and he arranged for his old ally Dinuzulu to return to South Africa and live in exile on a farm in the Transvaal, where he died in 1913. 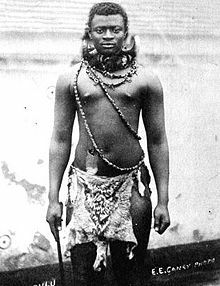 Dinuzulu's son Solomon kaDinuzulu was never recognised by South African authorities as the Zulu king, only as a local chief, but he was increasingly regarded as king by chiefs, by political intellectuals such as John Langalibalele Dube and by ordinary Zulu people. In 1923, Solomon founded the organisation Inkatha YaKwaZulu to promote his royal claims, which became moribund and then was revived in the 1970s by Mangosuthu Buthelezi, chief minister of the KwaZulu bantustan. In December 1951, Solomon's son Cyprian Bhekuzulu kaSolomon was officially recognised as the Paramount Chief of the Zulu people, but real power over ordinary Zulu people lay with South African government officials working through local chiefs who could be removed from office for failure to cooperate. KwaZulu was a bantustan in South Africa, intended by the apartheid government as a semi-independent homeland for the Zulu people. The capital was moved from Nongoma to Ulundi in 1980. It was led until its abolition in 1994 by Chief Mangosuthu Buthelezi of the Zulu royal family and head of the Inkatha Freedom Party (IFP). It was merged with the surrounding South African province of Natal to form the new province of KwaZulu-Natal. The name kwaZulu translates roughly as Place of Zulus, or more formally Zululand. The area is currently part of the Republic of South Africa as KwaZulu-Natal, one of the country's nine provinces, and a large portion of the territory is made up of wildlife reserves and a major contributing source of income is derived from tourism – the area is known for its beautiful savanna covered hills and stunning views. It is home to a WWF Black Rhinoceros reintroduction project known as "The Black Rhino Range Expansion Project" within the Zululand Rhino Reserve (ZRR). The ZRR is a 20,000 hectare reserve consisting of 15 individually owned farms that have lowered their fences in order to further conservation. The Zulu royal family still fulfils many important ceremonial duties. ^ "South African History Online". ^ "New History of South Africa". Archived from the original on 29 October 2013. Retrieved 18 July 2012. ^ Walter, Eugene Victor (1969). Terror and Resistance: A Study of Political Violence, with Case Studies of Some Primitive African Communities. ^ Hanson, Victor Davis (2001). Carnage and Culture: Landmark Battles in the Rise to Western Power. New York: Knopf Doubleday Publishing Group. p. 313. ISBN 978-0-307-42518-8. ^ a b c d e f "Zulu Kingdom". ^ Knight, Ian (2004). Zulu War. Osprey. p. 11. Bryant, Alfred T. (1964). A History of the Zulu and Neighbouring Tribes. Cape Town: C. Struik. p. 157. Morris, Donald R. (1965). The Washing of the Spears: the Rise of the Zulu Nation. New York: Simon and Schuster. p. 655. Deflem, Mathieu. (1999). Warfare, Political Leadership, and State Formation: The Case of the Zulu Kingdom, 1808-1879. Ethnology 38(4):371-391. Wikimedia Commons has media related to Kingdom of Zulu. Human Rights Watch report on KwaZulu, just before the 1994 elections – This includes detailed, well-referenced, sections on recent Zulu history.